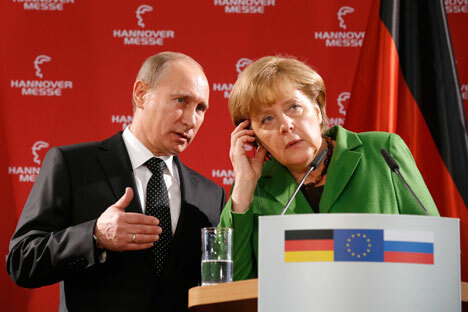 Russian President Vladimir Putin and German Chancellor Angela Merkel. If the information that Germany has excluded Russia from its list of its partners is true, this could be a source of regret and concern, Kremlin press secretary Dmitry Peskov said. "If the information about the new edition of 'the White Book' is true, it could be a source of regret and, also, concern," Peskov told reporters on June 6. He was asked to comment on a report of the newspaper Die Welt, which said that the new edition of the 'White Book', a document describing national threats to the German government, for the first time defined Russia as Germany's opponent rather than partner. This is regretful because if the newspaper's report is correct, it would be a matter of "obvious misunderstanding of the essence of the Russian position, which is consistent and is not aimed at confrontation, but rather seeks to create an atmosphere of interaction and mutually advantageous cooperation on the European continent," Peskov said. "There is concern because this position rests upon an incorrect understanding or, maybe, some incorrect information; this position can definitely lead to certain confrontational steps, which will absolutely not contribute to the atmosphere of mutual trust and cooperation," Peskov said.